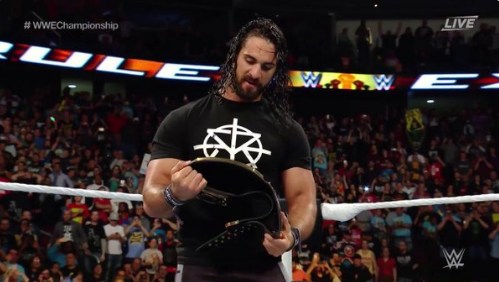 Former WWE World Heavyweight champion Seth Rollins made his return to WWE in the closing minutes of Extreme Rules on Sunday night in Newark, New Jersey. Rollins had been out of WWE action since tearing his right ACL, MCL, and meniscus back in November, which of course led to surgery. As Rollins was the WWE World Heavyweight champion when he went down with those severe knee injuries, he was forced to vacate the title, which Roman Reigns then won via a championship tournament. Well, after current Reigns defeated A.J. Styles on Sunday night, Rollins made his surprise return and hit Reigns with the Pedigree, holding up the WWE World Heavyweight Championship.